Good morning! 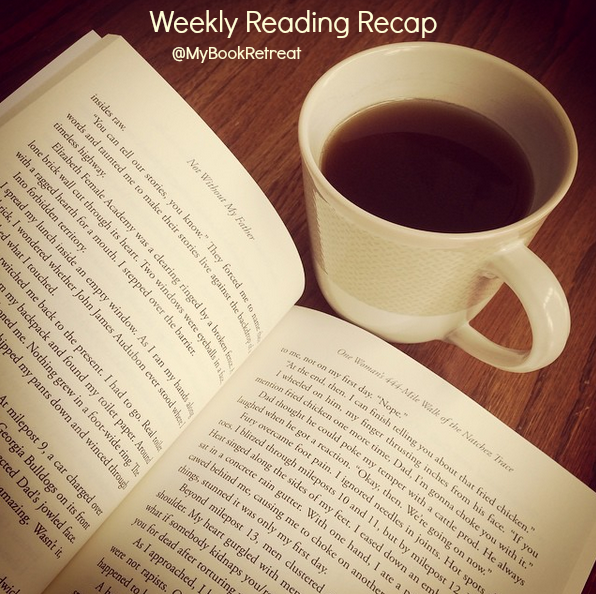 I hope you've had a nice few weeks since my last reading recap. My kids have started school and they both seem to be enjoying their new teachers and classmates. I've been extremely busy with work, as usual. We're all anxiously awaiting Fall arriving here. Starting today, I don't see any 90s in the 15 day forecast so that is a huge relief. The past several months have been hot and humid without any breaks so cooler weather, even just mid-80s, is quite welcome! I'd love to sit on my porch and read. 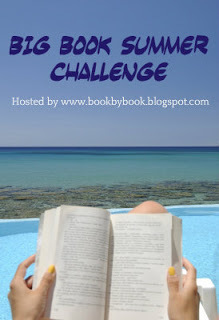 This summer I participated in the Big Book Summer Reading Challenge hosted by Sue at Book By Book. I only managed to read three books for the challenge, but I enjoyed all of them. I read The Invention of Hugo Cabret by Brian Selznick, The Fifth Wave by Rick Yancey, and The Secret Keeper by Kate Morton. This past weekend, I participated in the Fall Bloggiesta. I managed to get most of my list done, which felt good. Hopefully that will kickstart me into blogging more regularly now. I wrote two reviews, got my Reviews page updated and posted several reviews on Goodreads. I also participated in one of the Twitter chats - the closing chat last night. Since my last update, I read Truly Madly Guilty by Liane Moriarty. Unfortunately, I agree with many of the reviews I've seen that it was just okay. My review will be up this week. I am now reading Eleanor & Park by Rainbow Rowell, which I am enjoying. M, who is a 4th grader, read Claudia and Mean Janine, part of The Baby-Sitters Club series by Raina Telgemeier. She is now reading The Genius Files: Mission Unstoppable by Dan Gutman at home, and her class is starting to read Out of My Mind by Sharon M. Draper. Carter, who is a 7th grader, finished the Ascendance Trilogy by Jennifer A. Nielsen. He is now reading Seeker by Arwen Elys Dayton. I am having a tough time finding books for Carter now. We go to the library and just wander around picking things off the shelf because he's read so many of the popular series already! Any favorite YA books and series that you'd recommend for a 12 year old boy, or online book lists we could check out? Please let me know in the comments. He did read the Airborn series. I know he read a version of Frankenstein. Are Oppel's Frankenstein books something different? John Flanagan's Ranger's Apprentice and Delaney's Last Apprentice, since he can do medievalish fantasies. Lloyd Alexander's Chronicles of Prydain. So many things! 7th grade boys are my target demographic, so check out my blog, and please e mail me if you need suggestions. There are a ton of MG fantasies! I will definitely head over to your blog. And I may email as well. His friend, who he's Facetiming at the moment, said he wants to read Ranger's Apprentice so they've both decided to read that one. I'm making a list! OH! Don't forget Pierce's Alanna books. There are over 20. Cadnum's Book of the Lion. Spradlin's Keeper of the Grail. Wrede's Dealing with Dragons. So many! Same here on the 90+ degree days!!! Enough already. Doesn't feel like fall yet! And, hey, 3 Big Books this summer is GREAT!! And all good ones, too - awesome! If you want, you can add this post to the reviews & updates links list on the challenge page. Hope that helps! Enjoy your books this week! I know he's read the Everlost and Underland Chronicles series but not all of these. Thank you!! The picks this week are great. My list just grew. Happy Reading! I hope you've got lots of idea! I enjoyed Eleanor and Park, but not as much as Fangirl. I ended up liking Eleanor and Park better than Fangirl! The Invention of Hugo Cabret is a favourite. You may also want to check out his Wonderstruck and The Marvels. Thanks! Carter has read all three already! M and I just need to read Marvels. We've read the others.